Gain Control! 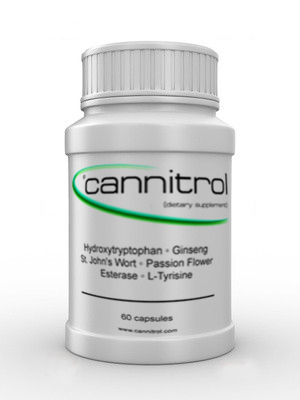 : Cannitrol© - Gain Control! A special blended formula with key ingredients 5-HTP, Ciwujia and St. Johns Wort, Cannitrol© can help you gain control over what seems uncontrollable. Cannitrol is a natural, organic, effective and safe blend. Cannitrol helps with mood swings, allows you to focus, and controls the munchies. 5-HTP is the precursor to Serotonin (a mood regulating neurotransmitter produced naturally by the body) and helps with serotonin production. Many smokers suffer from abnormal serotonin levels. Other ingredients include L-Tyrosine and Valerian Root. Using modern science with components from traditional Chinese medicine, this unique, all-natural blend helps promote a positive mood, decreases cravings, and facilitates productive activity during what would otherwise be a difficult time. Now with second generation Ginseng (Eleutherococcus Senticosus), Cannitrol helps alleviate symptoms of fatigue, insomnia, headache/bad mood, stress, neurasthenia, and sore muscles. Is a compound produced in the body from the Amino Acid Tryptophan. It is a precursor to the neurotransmitter Serotonin and the hormone Melatonin. Although 5-HTP may be relatively new to the United States, it has been available through pharmacies for several years and has been intensely researched for the past three decades. It has been available in several European countries as a medicine since the 1970s. 5-HTP supplements have become popular because it is thought that providing the body with 5-HTP in pill form can boost the body's Serotonin levels, similar to the antidepressants that are thought to increase the amount of Serotonin available to the brain. Eleutherocus Senticosus also called Ciwujia (pronounced su-wah-ja) promotes the formation of antibodies which boosts the bodies immunity and helps diminish toxicity that our bodies tend to store over time. Use of the extract helps combat stress and is quickly developing a reputation in the Western world as a successor to Chinese Ginseng (second generation ginseng). Used traditionally in the Americas and later in Europe as a calming herb for anxiety, insomnia, seizures, and hysteria. Scientists believe Passionflower works by increasing levels of a chemical called Gamma Amino Butyric Acid (GABA) in the brain. GABA lowers the activity of some brain cells, making you feel more relaxed. Passionflower may also be a mild Aphrodisiac. It's leaves and roots have a long history of use among Native Americans in North America. A recent study found that patients who were given Passionflower before surgery had less anxiety, but recovered from anesthesia just as quickly, than those given placebo. Is made from the Amino Acid Phenylalanine. It is converted into Dopamine and Norepinephrine. Supplementation with Tyrosine leads to alertness and mental arousal. L-Tyrosine benefits the body by converting thyroid hormone to Adrenaline during times of stress. Someone who is chronically stressed can have depleted levels of L-Tyrosine. Even though it is a large amino acid, L-tyrosine can cross the blood-brain barrier to enter the brain. Some people also apply Tyrosine to the skin to reduce age-related wrinkles. Is derived from a plant native to Europe and Asia. The root of this plant has been used for thousands of years as a remedy for various ailments including sleep problems, digestive problems, disorders of the nervous system, headaches, and arthritis. It is believed that Valerian Root has an impact on the availability of the neurotransmitter GABA in the brain. Contrary to popular myth, the modern drug Valium is not derived from Valerian, and there is no relationship at all between them. Is a plant with yellow flowers whose medicinal uses were first recorded in Ancient Greece. The flowering tops of St. John's Wort are used to prepare teas, tablets, and capsules containing concentrated extracts. Liquid extracts and topical preparations are also used. In recent years, St. John's Wort has been studied extensively. St. John's Wort is used by some for anxiety, and/or sleep disorders. Millions of people around the world see St. John's Wort as an alternative or natural treatment for depression. St. John's Wort was named because the flowers were said to bloom for the first time around June 24, the birthday of St. John the Baptist. The word "wort" means "plant" in Old English. St. John's Wort has long been used as a folk remedy for emotional disorders. It was once thought to rid the body of evil spirits. St. John's Wort has also been used for wound healing and for a variety of other conditions. St. John's Wort has also been suggested as a possible treatment for OCD.